Insulating your basement is a no-brainer. It's a smart way to make your home more comfortable and to reduce your heating bills. But, choosing the right insulation is not so easy. Depending upon your situation, you may use one or more insulations to get the job done, including one of various types of rigid and spray foam insulations. Spray foam insulation is well-suited to insulating critical areas in basements and crawl spaces that allow heat loss and cold air in. It is relatively immune to damage from moisture and water and is more energy efficient than fiberglass insulation, with R-values that range from 3.5 to 6 per inch, depending upon the type of foam used. Just as important, spray foam expands to fill small crevices, cracks, and openings as it is applied. It is ideal for insulating rim joists, the framing that rests on the top of basement and crawl space walls. Spray foam may also be used to insulate other areas, including basement and crawlspace walls and the bays between basement joists. After several years in a moist or wet environment, such as a basement or crawl space, fiberglass batt insulation is not a pretty sight. Unless it has been carefully installed, with a vapor barrier, moisture can condense in the batt, making it heavy and causing it to sag, fall, or compress. The paper backing of batt insulation, as well as any dust particles the fibers trap, can support the growth of mold. Spray foam insulation, on the other hand, is more effective at sealing out moisture and cold air, is unlikely to sag or degrade due to water damage, won't support mold, and provides a more substantial barrier against rodents and insects. While fiberglass insulation is generally less expensive than spray foam and DIY friendly, it is a less effective and permanent solution for insulating basements and crawl spaces. 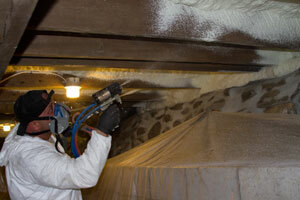 The two main types of spray foam insulation are open-cell and closed-cell polyurethane. Closed-cell is more expensive but generally preferred for basement and crawl space applications. It is denser, has a higher R-value, and is better at sealing out moisture, water, and air infiltration. Open cell insulation is better at sound absorption and less expensive. We're the right contractors for you if you'd like to learn more about how crawl space and basement spray foam insulation can improve the value of your home. Complete Basement Systems of NY offers free written quotes for spray foam basement joist insulation in Huntington Station, and to homeowners in Bay Shore, Hempstead, Valley Stream, Massapequa, Brentwood, Lindenhurst, Freeport, Levittown, Westbury, Patchogue, Huntington, Elmont, West Babylon, Great Neck, New Hyde Park, Long Beach, Hicksville, Merrick, Bellmore, Rockville Centre, Massapequa Park, Woodmere, and the surrounding areas in New York.